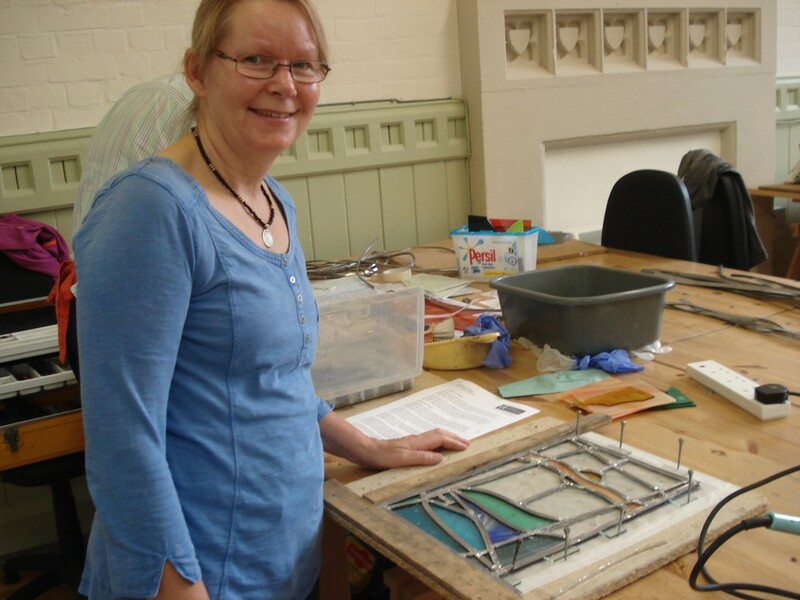 This weekend I completed my second stained glass class under the expert tutorage of Sarah Glover. 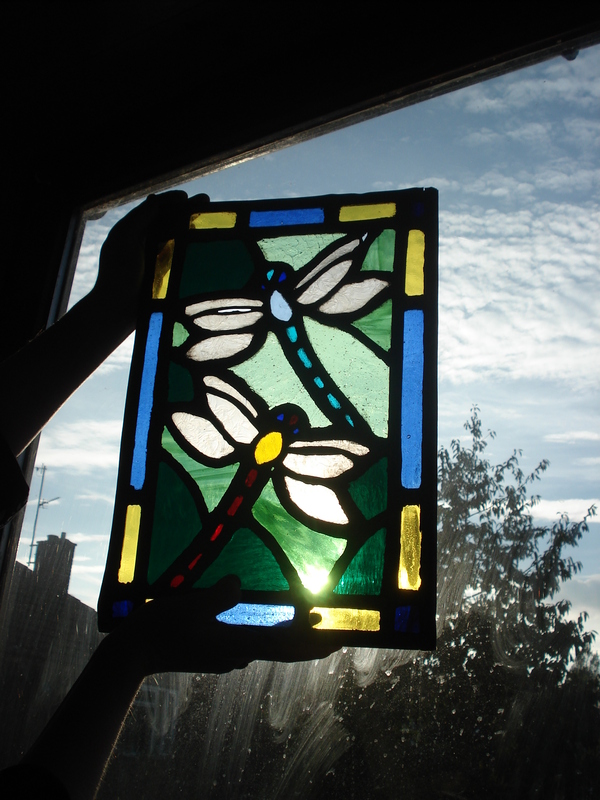 Before going to the class I was unsure what I wanted to make, at my first class I was convinced that I wanted to do an owl but this time I was torn between a mythical dragon (I blame cohabiting with a boy raised in Wales well that and Game of Thrones…) or dragonflies. My mind was made up however when I found this image. 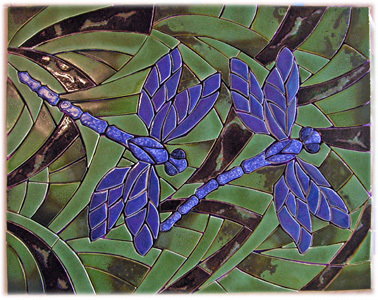 It was designed as a quilt pattern but someone else had interpreted it as a tile mosaic. 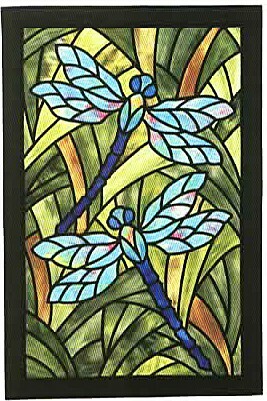 I fell in love with the design but wanted to change the dragonflies so they were different colours and simplify the background to make it suitable for stained glass. 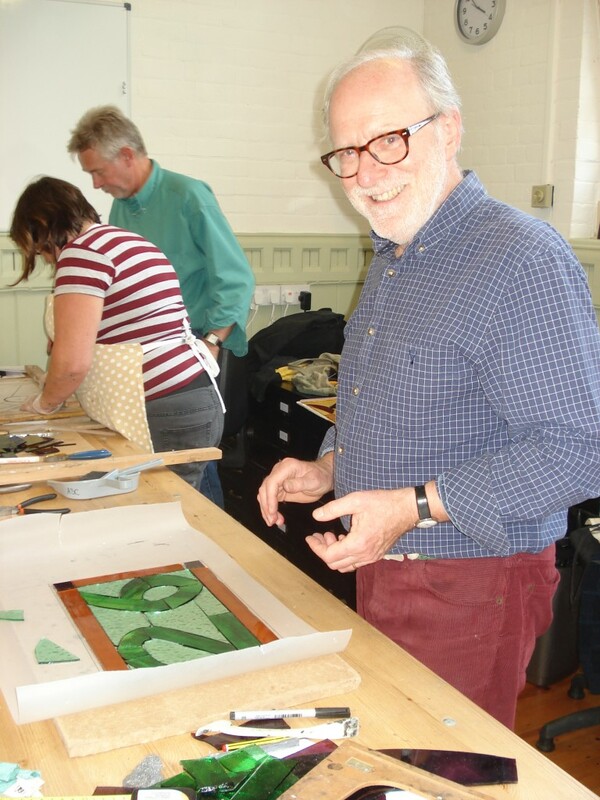 With the design decided upon it was time for the class. First of all we had to cut out the glass for our designs. 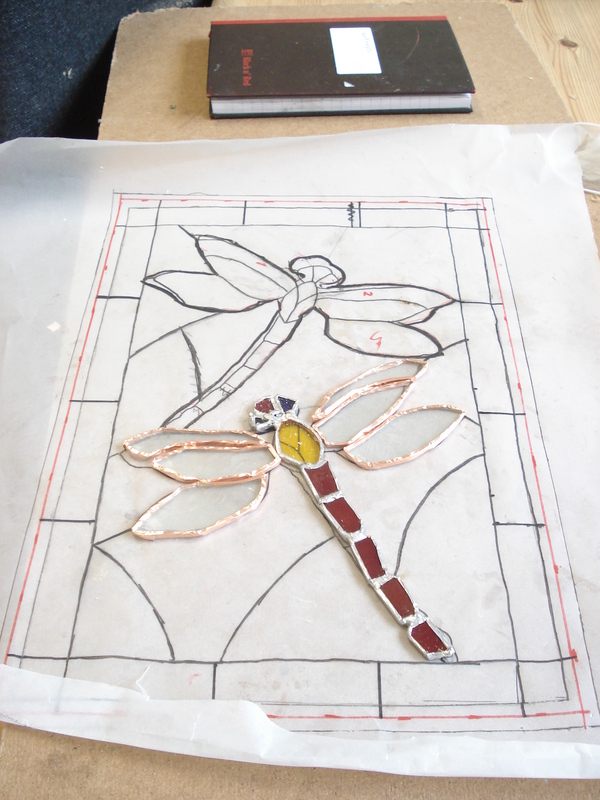 The first thing that had to be completed were the two dragonflies as once we had them completed we’d be able to see if the scale for the rest of the panel was correct. 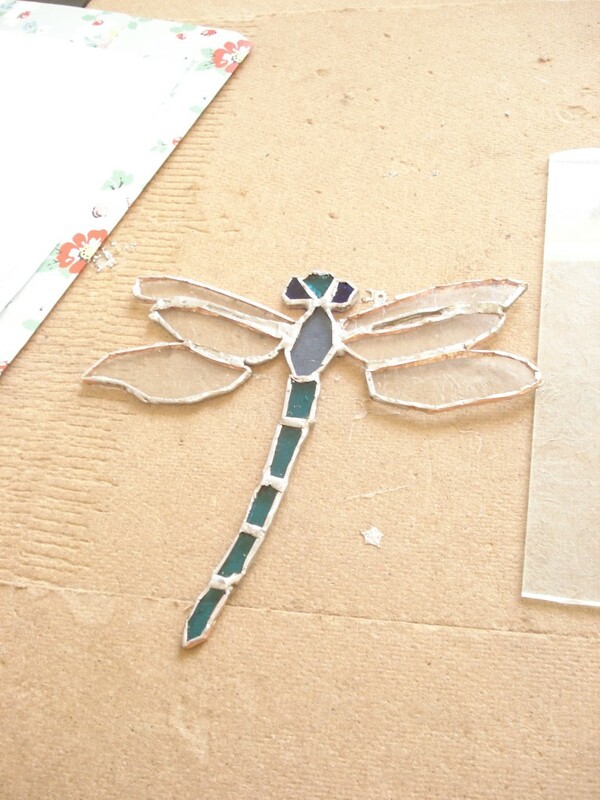 By the end of the first day I had one blue copper foil dragonfly. 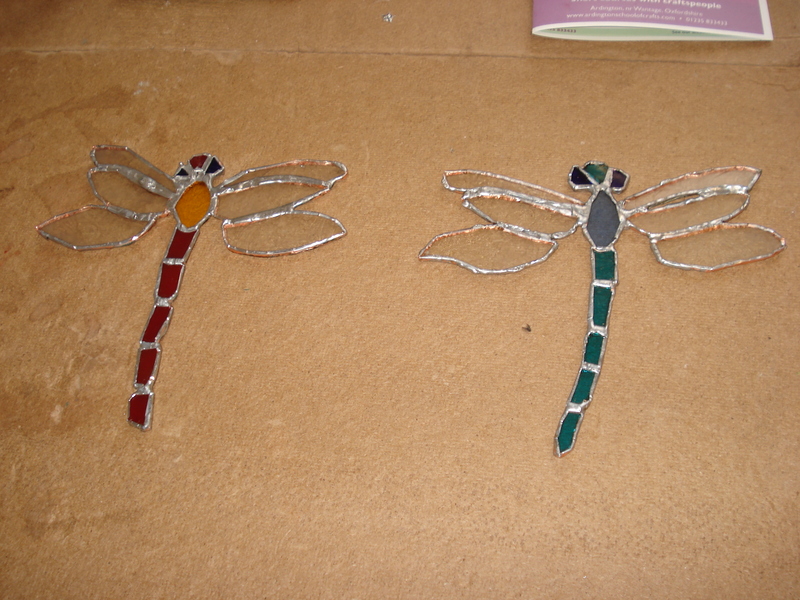 And one red copper foil dragonfly. 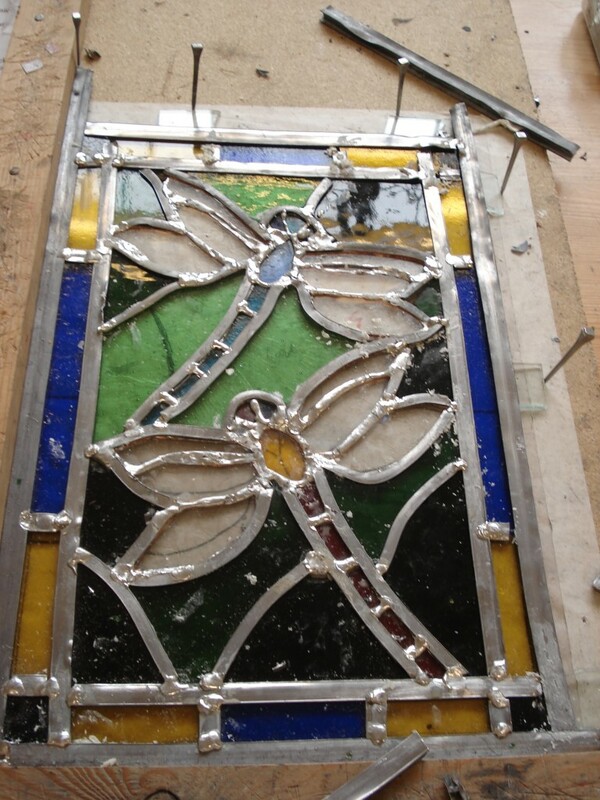 I stayed late to cut the glass for the border but still it was all to do on day two. 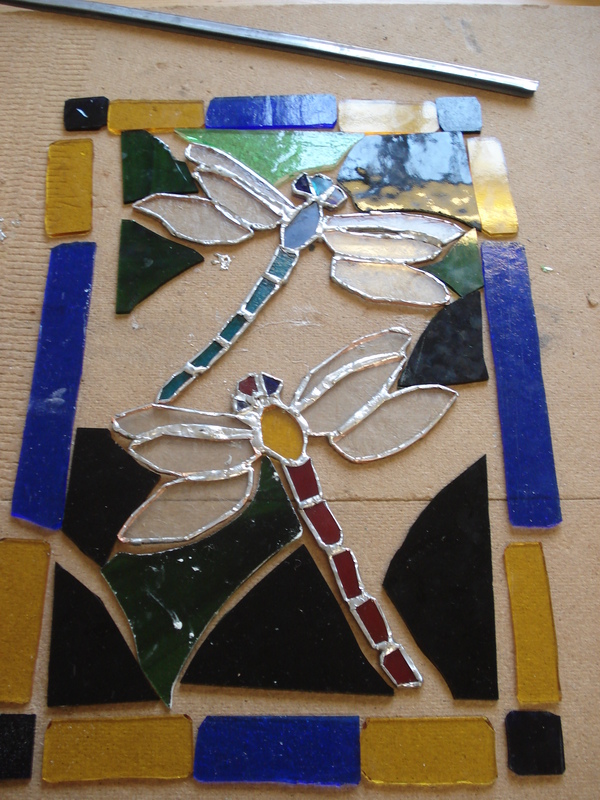 The rest of my class had not been so silly and chose to do simpler but just as beautiful designs. 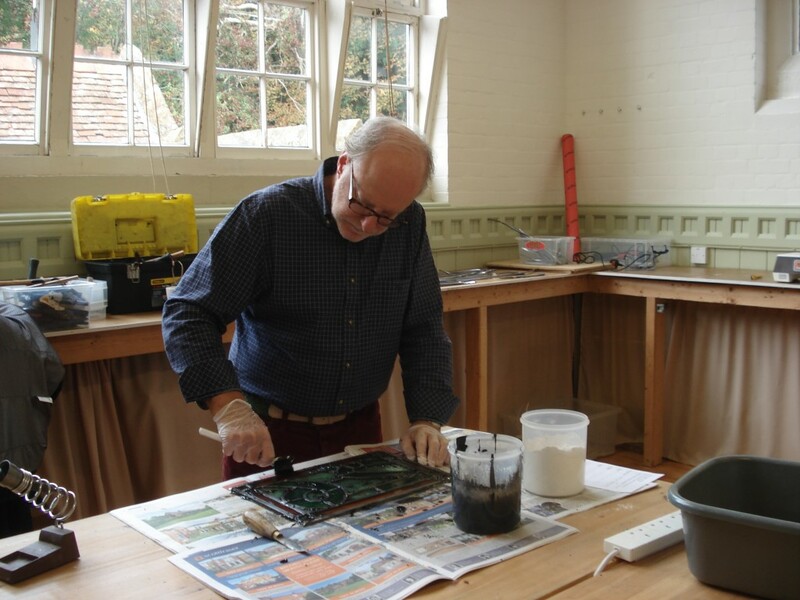 Here is David who you may recognise from my first class who had also come back for another go. He was completing a number for his house. Another one of my classmates was doing an abstract sea scene which was also very beautiful. 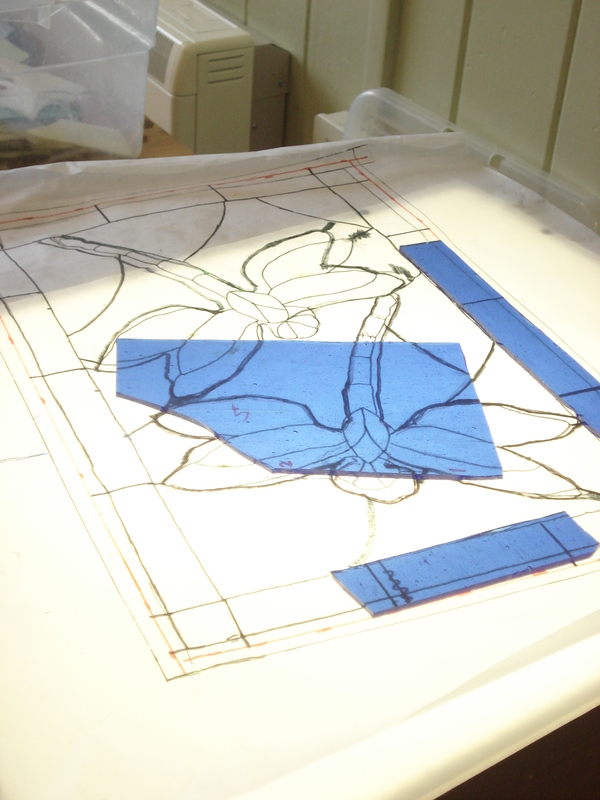 Because I chose to use quite a dark green for the background I had to have some help from the lightbox (seen here the mid blue for the border). 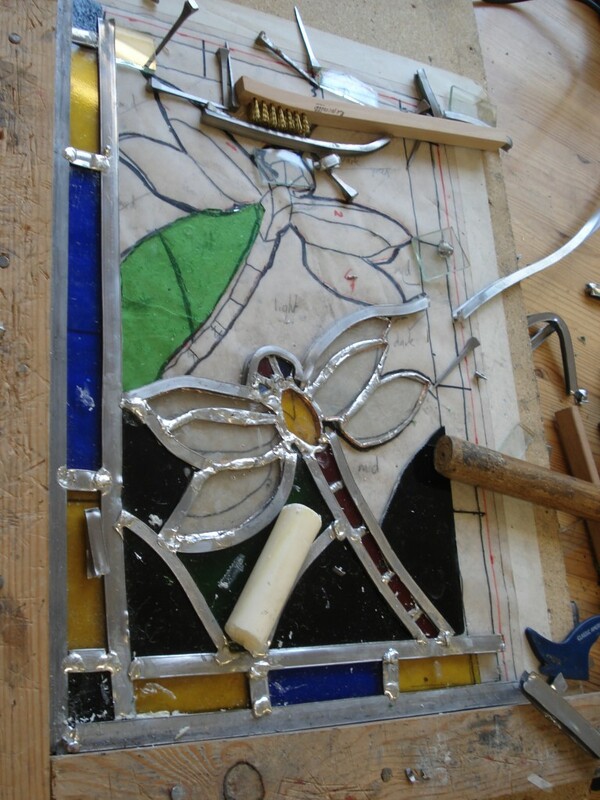 Finally I had all the pieces cut out and it was time to start leading. 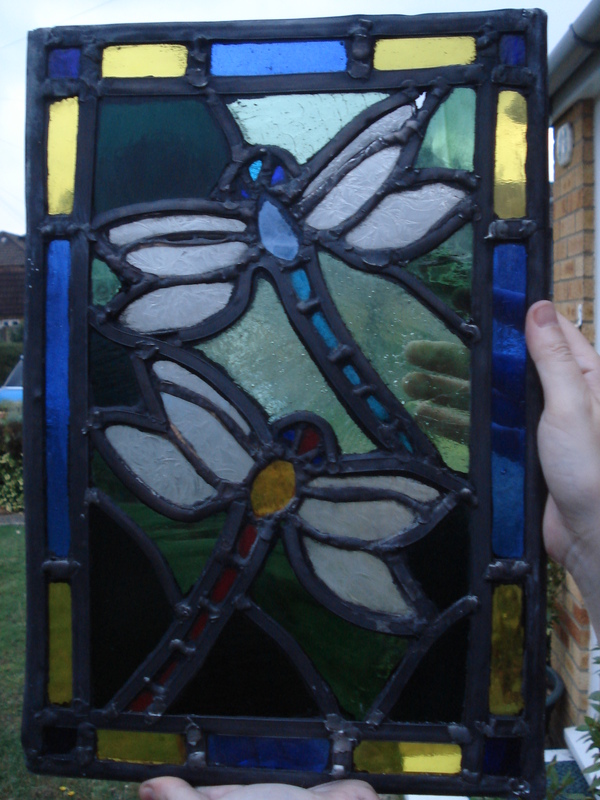 Getting everything to fit was probably the worst bit but after quite a bit of re-cutting and wiggling to get the dragonflies into position, I soldered as I went with those) the pane was complete. 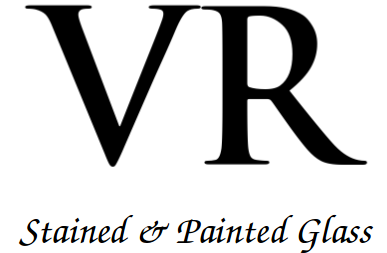 add a quick dry powder and give them a good polish. I’m pretty pleased with the result (I think maybe I should have used more of the lighter green in the background but I wanted to give the effect of a ray of sunshine coming through the grass). 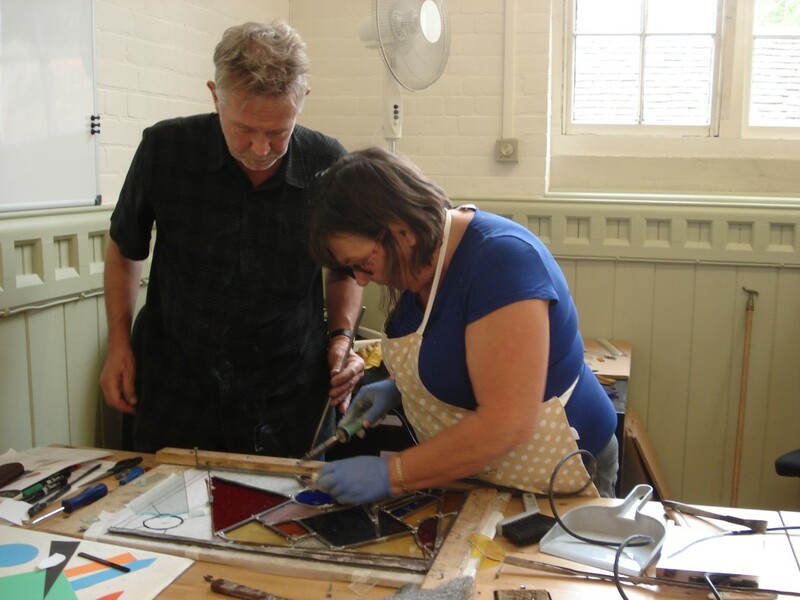 When the sun isn’t behind it the dark green looks black but I suppose that is the beauty of stained glass, the light transforms it, as seen below. 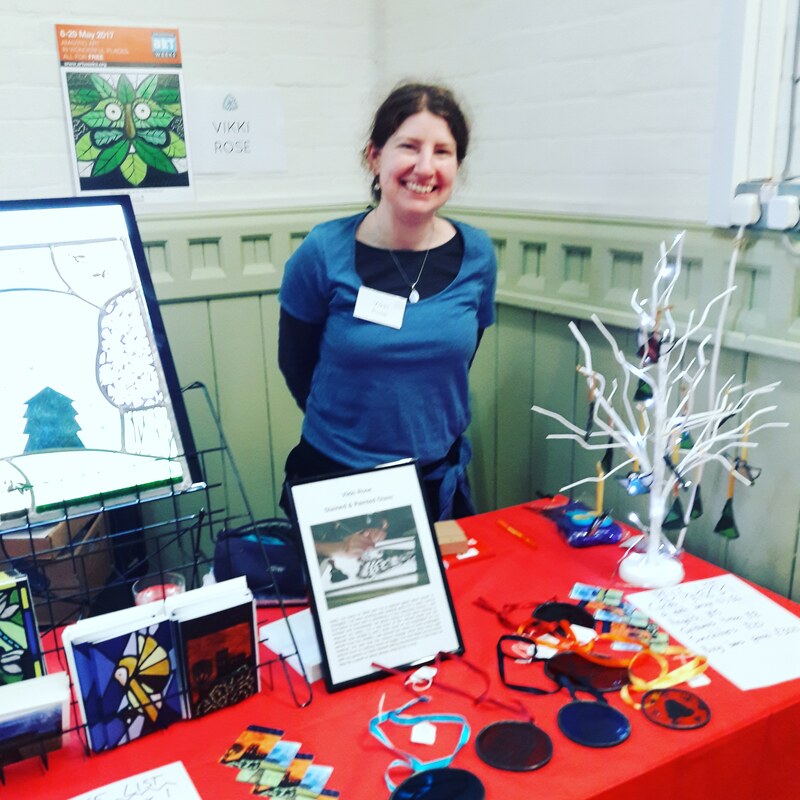 This entry was posted in Ardington, craft, creative projects, Handmade, inspiration, making things, oxford; local, stained glass. Bookmark the permalink.